Thankfully, WordPress blockquotes are a little less stressful. They’re actually a great way to break up a wall of text in your post. You can use them to quote other people or to simply offset a portion of text from the main body of your post. You can even quote yourself, and use it as a pull quote! But as helpful as they can be, sometimes the default blockquote style for your theme is flat out ugly. While most themes should apply some sort of style to blockquotes, it won’t always fit the aesthetic of your theme. 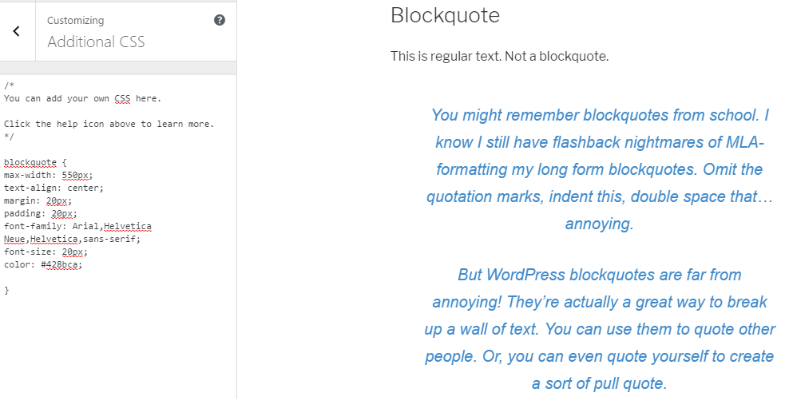 So if you find yourself needing to customize how the blockquotes on your site look, keep reading to learn how to style blockquotes in WordPress. To style blockquotes manually, you’ll need to add some custom CSS to your theme. You can add this CSS in a child theme (learn how to create a child theme), in the WordPress Customizer CSS box, or in your theme’s custom CSS settings (if your theme offers such a box). I’ll do it using the WordPress Customizer CSS box so that you can see my code side-by-side with the front-end results. But you can use whatever you feel most comfortable with. Now, I’ll run through a few ways in which you can use CSS to style your blockquotes. For all of these examples, you can easily change the colors I use by grabbing the hex code of your desired color and swapping it in for the color I use in the example. Similarly, you can change the thickness of the borders in my examples by increasing or decreasing the numbers. Considering most of the text in your post will be left-aligned, one way to make blockquotes stand out is to center align them. If you don’t want your blockquotes to have a separate background color, another method that you can use to offset them is lines or partial borders. If using CSS isn’t quite your style, you can still add some flair to your blockquotes using a plugin like Perfect Pullquotes. It adds a shortcode builder that helps you add left-aligned, right-aligned, or full-width quotes to your content. You can quickly change colors and font sizes. And if you’re actually quoting someone, you can easily add a citation. There you have it! 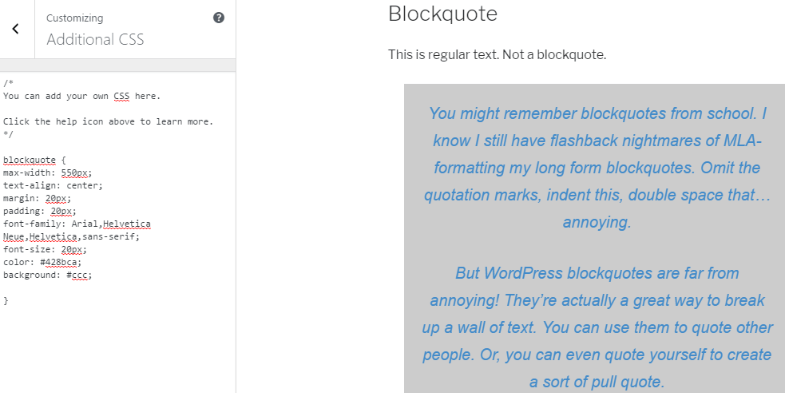 Two ways to style how blockquotes appear in WordPress. If you’re looking for another cool way to highlight text in your posts, you can also add eye-catching “Click to Tweet” quotes. And yet another helpful way to break up text is adding tooltips to your posts. Thank you very much for a post as visual as a video tutorial. I have been trying to do this for sometime, and never got the right tutorial. Great Article! I have one question: my current theme has a quotation mark that stays when I edit css this way. Looks stupid. Any idea how can get rid of that quotation mark? Thank you for the clear direction! Shannon Woodward 10 days, 0 hours ago.